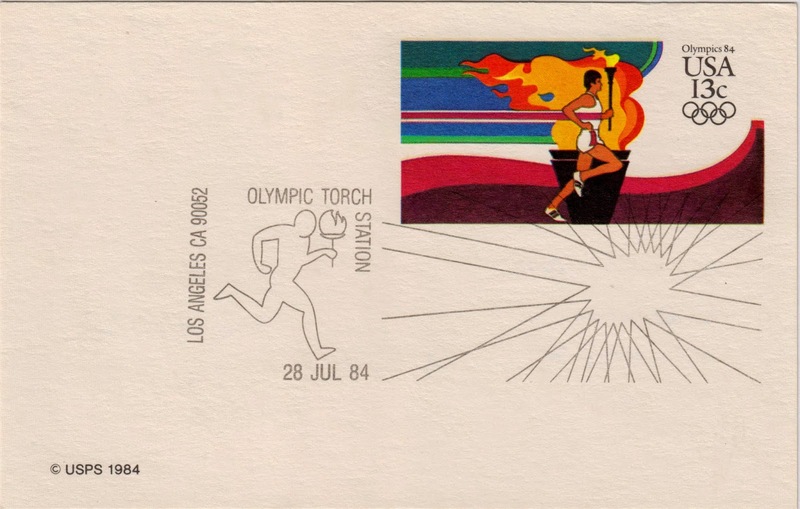 Outgoing postcard US-3373220 to China was a stamped postal postcard for the 1984 Summer Olympics with an Olympic Torch Station postmark in Los Angeles, California on July 28, 1984. The torch was lighted at 9:30 a.m. on May 8, 1984 on the lawn in front of the United Nations building, with the energy from the Olympic flame in Athens, Greece via a "heat reading" device and underwater cables. It then traveled 33 states in a 9,000-mile or 15,000-kilometer marathon relay from New York to Los Angeles in 82 days, passing through the hands of thousands of runners from all walks of life. Since I had a layover at LAX airport in Los Angeles earlier today en route to San Francisco, I thought it would be neat if I could mail it from LAX. To my disappointment, I found out that there was no US Mail drop box in the airport. The closest U.S. post office was at 9029 Airport Blvd., Los Angeles, CA 90009. So the postcard will have to be mailed from San Francisco.